Another insane year of film draws to a close and the time comes to reflect on the selections that stood out the most. This year was especially good to the horror community and I am here today to let you know about eight films that I thought were truly special this year! I'm still playing catch up on a few notable titles such as The Canal, Honeymoon, Late Phases and a few others, but I think I’ve seen most of the goodies from this year. I've tried not to delve too much into plot or anything with my picks, and opted just praise the films themselves. So without any further adieu, here's my list of Top 8 Favorite Horror Films of 2014! 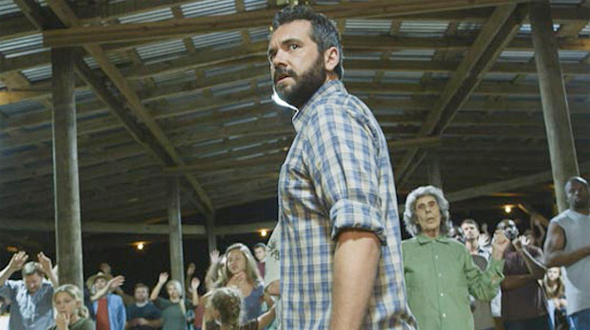 I saw The Sacrament originally at Fantastic Fest last year and was very much taken with the bleak and realistic telling of a cult scenario by director Ti West. The found-footage genre may be long tired at this point but using Vice as the outlet for the footage allows some decent believability to why cameras roll and why certain things are filmed. There's also stand out performances by Gene Jones as the leader of the ominous cult as well as AJ Bowen in the role of the lead journalist. The Sacrament may get some hate for having a bit of nihilistic view and telling of this sort of scenario, yet I think there is method to the madness in the hands of West as the film is blunt and bold to the last frame. Some people really dislike this flick so it’s definitely a bit divisive, yet it stood out to me as one of the year’s stronger titles. The first entry in the ABCs of Death franchise left much to be desired. I saw that one in the walls of the Alamo Drafthouse at its premier and enjoyed myself for the most part but felt little attachment to it upon leaving the theater. When the second film was announced, it boasted a roster of killer (heh) directors including Aharon Keshales & Navot Papushado, Julien Maury & Alexandre Bustillo, Vincenzo Natali, Larry Fassenden and many more. The second film delivered nearly on all levels for me and gave me what I expected the first film to be. The shorts are tighter, cleaner and quicker to the punchline, giving the viewer a better grasp on the overall concept instead of specific shorts. Some highlights for me were letters A, C, D, J, M, Z and definitely some others. All in all the second film’s makers learned from the follies of the first and tried to dial in their concepts and deliver sharp cutting short films that truly make for a really great time. Get some friends, pizza and beer and enjoy yourselves! Although I saw this in 2013, it saw a proper VOD release in April of this year so I am including it on the list! Afflicted is another found-footage flick that raised the bar and delivered some really cool and interesting new methods of story telling. The production took place in multiple countries employing multiple camera types and shooting formats to document the dark journey directors Derek Lee & Cliff Prowse take us on. I’ve seen the flick a couple of times now and some of the ingenuity of the guys’ camera work is still truly remarkable. Gore-hounds will definitely enjoy this one as the film definitely gets grisly as it goes on. The story is strong, the character work is fairly personal and solid and overall Afflicted is just a really fun little horror flick and definitely worth your time! This was recommended to me by my loyal co-host on The Golden Briefcase, Jeremy Kirk as something that was surprisingly original despite its familiar feel and approach. Well, I am happy to say that Jeremy was right and this film is actually quite fun. And guess what? Found footage film number three on the list! 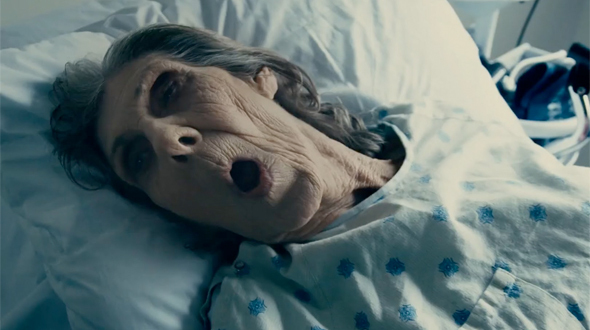 Some of the traditional gripes and tropes still definitely exist in The Taking of Deborah Logan yet what this film has to offer is some great original story! Following what appears to be a typical demonic possession type case, the viewer is then thrown for a few twists and turns with the documentary crew filming Alzheimer's patient Deborah Logan. Things begin to get increasingly more intriguing as the plot unfolds and the crew uncovers more than just a standard Alzheimer’s victim case. I found the film to be a fresh surprise to my expectations, despite the title being somewhat reminiscent of a B-level Netflix horror entry. Check this one out folks, because like me, I think you will find it to a be a refreshing and chilling surprise. Housebound is another title I saw at this year’s Fantastic Fest yet the New Zealand film had already premiered at SXSW to wonderful reviews. There were mentions of the film bearing the tone of early Sam Raimi and Peter Jackson in terms of the handling of comedic tone in a horror film. The plot seems simple enough involving the house arrest of main character Kylie Bucknell at her mother’s home. Things of course, are not what they seem and we are taken on a hilarious and exhilarating detective’s journey through the mythology of the house and those who have and are currently inhabiting it. The film is packed with some truly excellent horror gags yet the comedy triumphs at every stop. Tension is relieved beautifully with perfectly timed jokes and punch lines to create an extremely satisfying film experience. Housebound rings true in the spirit of Shaun of the Dead, Dead Alive and Evil Dead, and will definitely be a frequent re-watch in my residence. 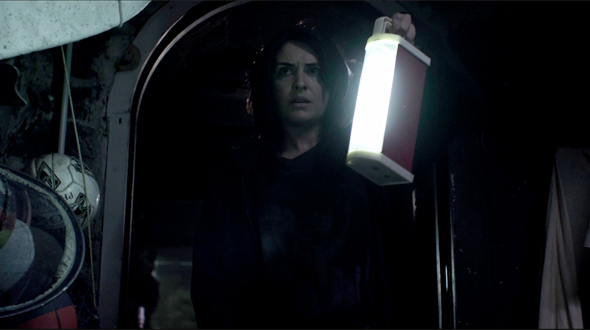 I was a fan of Mike Flanagan's first film Absentia and was anxious to check out his follow up when it came out in April of this year. I missed the flick in theaters but was able to recently catch it now that it’s streaming on Netflix. I really, really dug Oculus and was pleased to see Flanagan grow as a filmmaker. The film is shot beautifully and I was such a fan of the color pallet throughout. The story revolves around a mirror that is clearly inhabited by a very sinister force. The plot device of the mirror works throughout the story, continuously bringing its victims obsessively back to it and its demands. Karen Gillan and Brenton Thwaites do a truly great job as the two siblings who have decided to end things with the mirror once and for all. The real marvel of the film is its ability to mess with your head and sanity as the viewer, right along side its characters. Flanagan’s direction is also wonderful with some of the film’s best secrets involving a perfectly timed cut or a an exquisite framing. I know some others have been a bit mixed on it but I thoroughly enjoyed the bleak and thought-provoking journey of Oculus and have been recommending the film ever since. I just watched Starry Eyes a few days prior to writing this article and was instantly irritated that I hadn’t seen it earlier. The film is great. Starry Eyes paints a seedy and provocative Hollywood tale about a young starlet named Sarah who wishes for nothing more than to be a leading lady and is at her wit’s end with the day to day grind as a waitress. She is willing to do anything. The story has been explored before to some degree, yet Kevin Kölsch & Dennis Widmyer want to take us on an even darker journey that is washed in throwback vibes with alluring cinematography and an ever building synth soaked score. The character archetypes feel Lynchian and often slightly larger than life, which adds so much eerie atmosphere to the viewing of “Big Hollywood” and the evils that lurk there. Alexandra Essoe must be commended for both her emotional and very physical transformation throughout the film and for meeting the demand of vulnerability required by the role. We are taken down to her darkest place with her and experience her panic, paranoia and pain explicitly due to wonderful direction by the filmmakers. There are some shots in the film that are framed immaculately and are almost startling upon sight. Without delving into the plot too deeply, a certain turn occurs in the story which sends Sarah down a very dark and visceral path, built with great finesse by Kölsch and Widmyer. By time the credits role, the viewer has been through a harrowing journey of how far one young star will fall so she can shine the brightest of all. It’s always a hard thing to define my favorite horror film of the year. There are so many things I look for in a great horror movie and it’s often really hard to find as many of those things in one picture but this year that film was The Babadook. I saw this at Fantastic Fest during one of the final days. The film had already played and I was seeing it with a second round audience. The theater was packed. The buzz had been built. This film was good. Jennifer Kent spins a tale of a single mother still grieving the death of her husband and her day to day handling with her unstable child. Essie Davis and Noah Wiseman play these roles to perfection with Wiseman’s Samuel often instilling the viewer with the same annoyance and frustration as Davis’ Amelia. She is stretched so thin and Samuel is elevating things with his fear and fascination of a storybook boogeyman, Mr. Babdook. 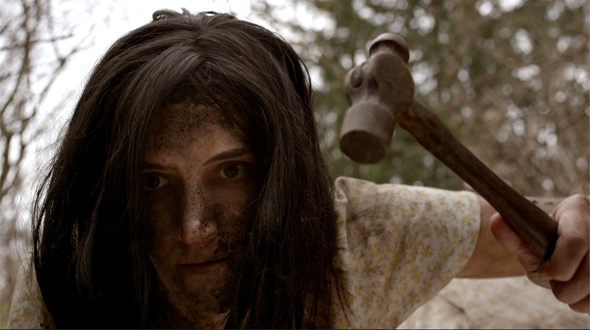 Where the film excels is in its subtle scares and tension building. Masking the overwhelming paranoia of a visit from Babadook with a mother’s exhaustion and borderline rage brings one to their wit’s end with Amelia and opens the door for some genuinely creepy moments. Jennifer Kent’s debut is shockingly mature and her direction and pacing are wonderfully restrained. She takes her time with careful unfolding tension of Babadook and its symbolisms and builds such a fascinating dynamic between mother and child. Shot selection and use (or lack of) score must also be commented on, as there are moments which are truly terrifying or unnerving without giving any sign to their coming. I have recommended The Babadook all year and am so pleased to see it on so many Top lists this winter. 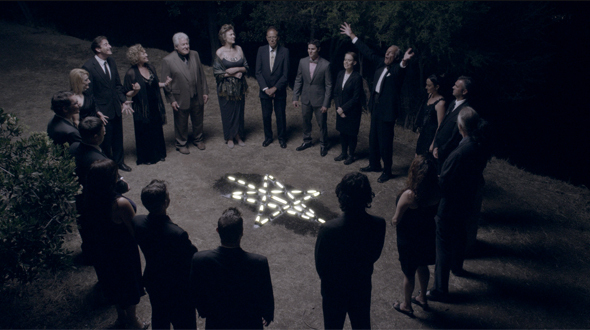 The film is readily available on VOD and will be disc later this year. It would be wise of you to seek it out now! So those were my favorite horror films of this year and I am already looking forward to assembling this list next year! Horror is alive and well in the indie community and I am so pleased to see major studios like Blumhouse giving these directors a platform to show their work. We have many to look forward to this coming year including Insidious: Chapter 3, It Follows, [REC] 4: Apocalypse, Sinister 2, Goodnight Mommy and so many more. What do you think of Tim's Top 8 Horror Films of 2014? Bold List, Tim!!! No fear. I really wanted to like Oculus, but I just couldn't "buy into" the story. I felt like the characters' actions were too forced and the film relied on flashbacks too much. Also, there were too many visible ghosts in the film, which really take away from the suspense in my opinion. I really liked Babadook but the ending just ruined it's value for me. The ending or the whole movie for that matter is not necessarily what you think. Babadook is beyond a regular horror film because the spook isn't necessarily real. Its an interpretation or metaphor representing the anxiety, depression and loneliness of the main character and her son. The extreme drain and depression that the movie evokes blended with the horror spook metaphor is amazing. Its an excellent movie. Although its considered horror its really more of a character introspective movie. When the first movie listed was The Sacrement you lost me already. Movie was pure cr@p.